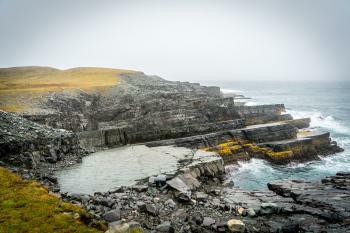 Mistaken Point is a 17-kilometre-long coastal strip renowned for its fossil deposits on exposed rock surfaces. 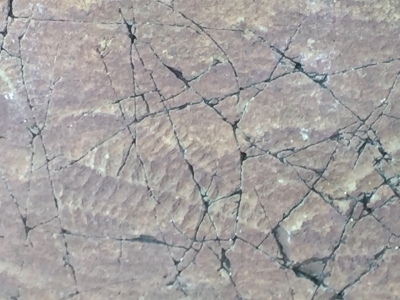 The more than 10,000 fossil impressions date from the middle Ediacaran, 580 to 560 million years ago. They show the transition of life on earth from microbe-dominated to the ancestors of animals as we know them. The site was first discovered in 1967, and lies in Canada’s Newfoundland and Labrador Province. The name alone conjures up shipwrecks and those who ventured where they should not have. This is a challenging site, and weather conditions should be taken into account. While it is only 70 kilometres from St. John’s, it feels a world apart, and the road had surprisingly little traffic. However, in July there was a waiting list to do the tour, which is the only way you can see the fossil area. You need to book a few weeks ahead, and checking the forecast is a good idea too. The tour does not go ahead in very wet, foggy or windy weather, so call before you proceed. The landscape is stunning, with open fields and wide vistas, as well as having sections with wildflowers and stunted forests created by the strong winds. We were lucky to draw a dry day, and the 3 km walk each way is mainly difficult near the end where you have to ford a river by stepping on rocks. These can be slippery when wet, and sometimes the water may be too deep to see the actual stepping stones. Once near the fossil area, you need to put on felt booties, which protect the delicate rock faces but aren’t great for grip near a steep cliff edge and raging seas below. The fossils themselves are interesting and are of sea life from ancient times and fairly eroded, so the guide is quite useful. Our tour consisted of mainly older people and one rambunctious child, so we were happy to make it back to the visitor centre without incident. The staff were great, but there aren’t many facilities in the area to stay or eat. Those of you who depend on public transport might prefer to rent a car. The gathering area near where the walk commences is some 15 minutes away from the Welcome Center and everyone usually goes there in a caravan of automobiles! All in all, this site was unforgettable! We visited Mistaken point on Canada Day 2018 and was greated with cake at the visitor center. It was rainy and cold, not the best for a hike out to the fossil site. The visitor center is on the highway at Portugal Cove South, outside the sites boundary. It is about 2 h by car from St. John and you will need a car to get to there. You also need to join a tour to get into the core zone. We had pre-booked a tour on the website at 13:00, the only one that day. Quite a steep price, 24 CAD per person. The visitor center was small and kind of boring. No cafes or store around either, so bring some food and drinks because the tour took about 2-3 hours. First there is 10 km drive to a parking lot followed by a 3 km hike through the marshland. Some places were really wet, so hiking boots are recommended. The rain and wind really made it a cold walk, but as a miracle it stopped raining when we got to the core zone 😊. The site is by the ocean and sometimes whales can be seen although we didn’t. At the actual site we had to take off our shoes and put on some soft slippers before we could walk out on the fossil site. On our tour in Canada we visited all the fossil sites, and this was clearly the most interesting one. 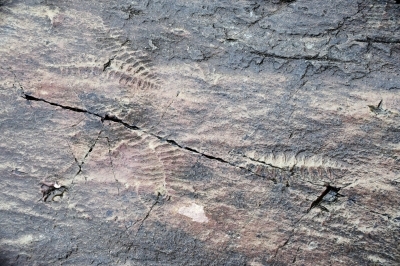 The fossils are 500 million years old, and there were so many and so visible. Really amazing. If you are visiting on a rainy day, bring extra socks. The slippers you are wearing on the rocks get wet and so does your socks. From the parking lot at Mistaken point, there is a 10 km short detour on gravel road to Cape Race Lighthouse. In 1904 they put up a Marconi wireless radio station at the lighthouse. I 1912 it was all over the news, when they received distress calls from Titanic. There is a small museum on the site. Worth a visit to this outpost when you are in the area. I visited Mistaken Point in October 2016. 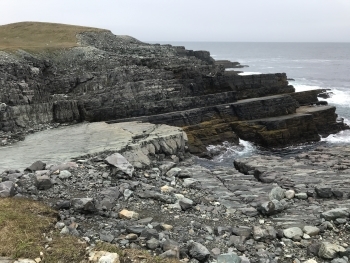 Mistaken Point is home to the oldest multicellular fossils on Earth. They are found in a thin layer of rock which is right on the Atlantic Coast. While the site can be visited on a day trip out of St. John's, there are several things you should know before you go, as they could ruin your trip. The most important thing to know is that you can only access the fossils on a group tour which starts at the Mistaken Point visitor center. Also, only a small part of the Mistake Point Ecological Reserve is part of the world heritage site. Read more about Mistaken Point on my website. It is surprising that the site remains without signage. I wish I could put some interpretative sign boards there. I remember every bit of the area even after 40 years of my long association with the fossils and rocks of the region.I am in the possession of fossil bearing original rocks and casts of fossis. My Masters thesis submitted to Memorial University details the terrain how it was like in 1967-69. I came across this site almost by accident. After a long hike with a friend through some medium difficult terrain and fording a small stream we came across these breathtaking rocks, full of fossils. Quite unprotected from the weather and no interpretative signage. This place desperately needs preservation and also protection as we could have walked on top of these precious remnants of human beginnings. We were the only two there but subsequently ran into the local archaeologist who filled us in on what we'd seen. Whales: Minke and humpback whales can be seen outside the coast of Mistaken point. Shoe covers required: "we had to take off our shoes and put on some soft slippers"